This is an assortment of economical handmade marbles featuring floral, swirled, feathered, and foil designs in various colors and patterns. They are also a great accessory to a marble kaleidoscope (find under the art glass category) as you can swap them out to get new amazing patterns. 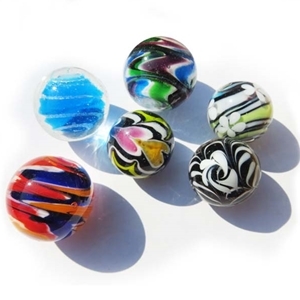 You will receive 6 different marbles in this assortment pack, and they may vary from the photo shown. The marbles measure approximately 22 - 25mm in diameter. Warning: Marbles are a choking hazard. Not appropriate for children under 4 years.